As the preparations for the procession begin, all routine activity in the town comes to a standstill. The temple kitchen  the largest in the world  serves more than 75 quintals of rice everyday along with 55 other dishes. These are offered to the gods in the temple and later distributed as Mahaprasad to the devotees. A fortnight before the Rath Yatra, the three deities are given a holy bath on an open platform  the Snana Vedi. Since the images become discolored as a result of the bath, they are kept away from the public. At this time, the deities are said to be ill and are left to rest in isolation. A day before the procession, three gigantic chariots are exquisitely decorated and lined up outside the temple gates. Lord Jagannath's chariot, the red and yellow Nandighosh, is about 45 feet in height with 16 massive wheels and a gold dome on top. The red and green Taladhwaj is only slightly smaller and belongs to Balabhadra. The smallest, Dev Datan belongs to Subhadra, who travels between the chariots of her two brothers. 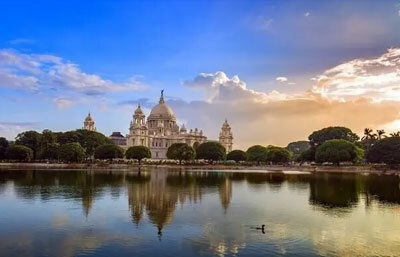 These grandiose structures, with brightly colored canopied tops, resemble the 12th century Jagannath temple in shape. Embellished and decorated with tinsel and ancient accessories, each of the chariots has a large platform covered with huge flower umbrellas. On the morning of the Yatra, the rhythmic clang of metal gongs, blowing of conch shells and trumpets and chanting of holy men fill the air as priests called Daityas vbring out the bedecked idols to their raths. 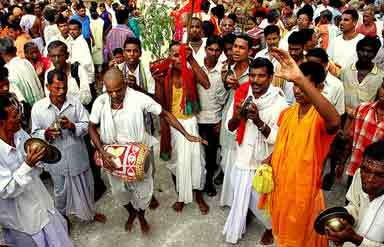 Lord Jagannath makes his appearance first, amidst ecstatic cries of 'Jai Jagannath'. The overwhelmed jubilant crowds work themselves into a state of devotional frenzy, as if hypnotized by the large eyes of their beloved Lord. He performs the Chhera Paharna, to express his humility before God. He sweeps the chariots with a gold broom and sprinkles holy water on them. There is a deafening roar of cheer as the procession inches ahead. Balabhadra the eldest brother takes the lead followed by Subhadra and Jagannath. The chariots are drawn by 50-metre long ropes attached to their front. Devotees surge ahead for an opportunity to give a hand in pulling the ropes, as it is believed that this will absolve them of all their sins and help them attain salvation. One of the unique rituals of this procession is the Lord's visit to his aunt's house. It is said that the three siblings do not like visiting their aunt who is said to be mean. However, the three go to the mashibari after being ritually scolded by the head priest. 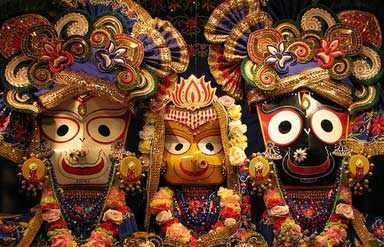 There is an interesting story about how Lord Jagannath, one of the various forms of Krishna, came to take this shape. The image of Lord Jagannath is said to have been created by Vishwakarma himself. Commissioned by Lord Vishnu to create this idol, Vishwakarma promised he would dazzle the gods by his creation but only if he was able to work alone unseen. When many months passed by, Lord Vishnu got impatient and forced open the doors. The image was ready but the arms were incomplete.Even today Lord Jagannath stands in the temple with two stumps for arms.